Robert "Bob" Alan Severson was born on September 28, 1955 in Clinton, Iowa to Milt and Gloria (Naser) Severson. He married Kim (Clark) on April 27, 2012. Bob was self-employed in the machine tool sales and construction his entire life. He was a member of Immanuel Lutheran Church. Bob cherished time spent with friends and enjoyed road trips, his ’57 Chevy, the Green Bay Packers, and old westerns on TV. Bob loved his family greatly and especially adored being around his grandchildren. 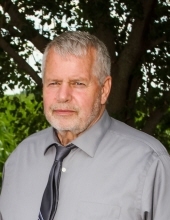 Bob passed away September 18, 2018 at Israel Family Hospice House in Ames at the age of 62. Bob is survived by his wife, Kim; former wives, Sheri (Hanson) and Brenda (Severson); a son, Jacob (Maddie) of Story City; a step-son, Seth (Willow) of Story City; six grandchildren, Jackson, Calvin, Olivia, Easton, Mya and Logan; his mother, Gloria Severson of Story City; a sister, Mary (Steve) Peterson of Story City and much loved nieces, nephews, and the their children. He was preceded in death by his father, Milt and a brother, Jerry. In lieu of flowers, memorials may be made to Immanuel Lutheran Church, Israel Family Hospice House or the Iowa State University Foundation. To send flowers or a remembrance gift to the family of Robert "Bob" Alan Severson, please visit our Tribute Store. "Email Address" would like to share the life celebration of Robert "Bob" Alan Severson. Click on the "link" to go to share a favorite memory or leave a condolence message for the family.